Since its founding in 1973, Schwab has led the full-brokerage market by stressing customer service. Today, Schwab has established itself as a company with a unique identity: old-fashioned integrity meets technology-empowered financial services. Charles Schwab tells the compelling story of this organization's uncanny ability to reinvent itself around an unchanging set of core values. This book is organized into five sections, each representing a critical juncture for the company when it was forced to reinvent itself or be consumed. 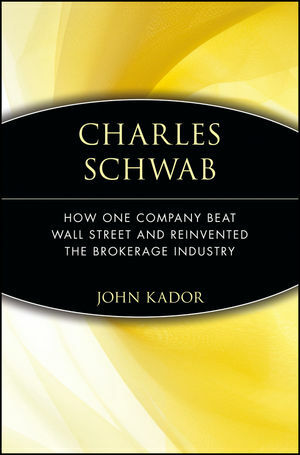 Along the way, Kador highlights Schwab's immutable laws, direct from the Chairman and CEO: 1) Create a cause, not a business; 2) the corporate vision is only as good as the values of its culture; 3) welcome upheaval. In the whirlwind economic environment we currently face, Charles Schwab provides readers with valuable lessons on how businesses can survive and thrive in any situation. JOHN KADOR is the author of four books, including Net Ready: Strategies for Success in the E-conomy (with Amir Hartman and John Sifonis)a Wall Street Journal, BusinessWeek, and New York Times business books bestseller. Kador is a freelance writer for a number of business publications, and is curently working on a book about healthcare with Hank McKinnell, the Chaiman and CEO of Pfizer, Inc. Appendix 2: Charles R. Schwab's Employment Agreement.